I have to admit that I was confused about the invention of Velcro. It wasn't from studying the gecko as I had thought (and possibly written), Velcro was inspired by burrs on a dog's fur. Even so, it was an early example of biomimetics (studying nature for applications that benefit humans). Interesting that when man imitates God's creation, he has limited success. Anyway, the gecko is getting studied for biomimetics as well. The gecko's ability to "stick" to surfaces, become unstuck, repeat as much as necessary, is based on atomic forces and the hairs on their feet. But tape, Velcro, and so on wear out, unlike the critter's footies. Naturally, someone is going to invoke Evolution of the Gaps so Darwin can get the glory, even though they have no reasonable explanation or model. The actual reasonable conclusion is that the Creator designed them this way — and we can benefit from studying them. 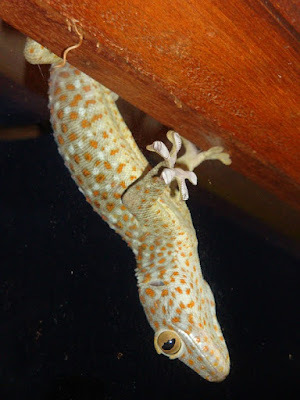 Geckos have an amazing ability to stick to surfaces—they can even run upside down on polished glass. About a decade ago, it was shown that gecko feet have microscopically structured hairs that exploit atomicscale attractions (van der Waals (vdW) forces). Later, the same principle was discovered in spiders. This short-range attraction is so strong that a tiny contact area is enough to support the creature’s weight. You can read the rest of this short article by clicking on "How geckos become unstuck".